Thank you to reader Brandie for emailing me this find! 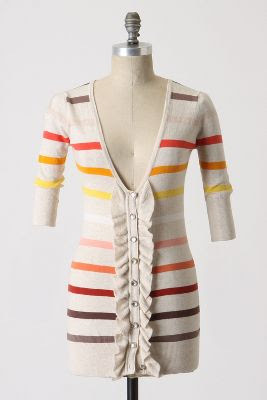 Anthropologie's Rise and Fall cardigan by Charlotte Tarantola originally retailed for $128 but is no longer available. This Forever 21 sweater is definitely inspired by the Charlotte Tarantola version, although it's missing the front ruffle. It retails for a very reasonable $19.80 and you can click on the photo below to purchase or for more information. Oh this is a GREAT look for less. I'm going to check the F21 sweater out since I missed the boat on the Anthro sweater. Thanks J!